When it comes to tankless water heaters running on gas, Rinnai has proved to be a definite leader. Naturally, there are numerous Rinnai tankless water heater reviews all over the Internet. In this review, we will discuss the Rinnai RUC98iN Ultra Series Natural Gas Tankless Water Heater – one of their most energy-efficient, as well as most popular and powerful models. If you are tired of watching your family waste a ton of water every time they need to shower, it might be time to consider a tankless water heater. With technological innovations the Rinnai brand has introduced, switching to a tankless water heater doesn’t have to be as complicated as before. The Rinnai RUC98iN natural gas tankless water heater is an amazing unit for any home. With its state-of-the-art technology, you will save a lot of energy and spend significantly less on electricity bills. Moreover, the design of Rinnai RUC98iN is sleek and compact; that makes it easy to find a spot for it. You can install it almost anywhere in your home. Even at first sight, the Rinnai RUC98iN leaves a lasting impression. If you look at the Rinnai tankless water heater sizing chart, you will see that in comparison to most tankless water heaters, this Rinnai indoor tankless water heater is somewhat heavier, but it also provides more in terms of power. It can run on either natural gas or propane, and it has either twin pipe PVC or concentric venting options. Also, with energy factor rating of .95, this model is Energy Star certified. Rinnai gas tankless water heater has bigger gas and water supply inlets. In standby mode, it will only draw 2 watts of power. But, when it starts working, you can expect it to consume around 64 watts of power. During winter, when the temperatures are very low, it can use up to 146 watts of power in order to prevent its components from freezing. The min-to-max gas burn rate varies from 15,200 to 199,000 BTU, which is a very wide range. Plus, at 0.26 to 9.8, the flow rate of hot water is wide as well. With these figures, you can be sure that Rinnai RUC98iN ultra series will provide endless hot water to all bathrooms and faucets in your home. The residential model can heat up water from 95 to 140 degrees Fahrenheit, while the residential one can go up to 185 degrees Fahrenheit. Bear in mind that this tankless water heater is more on the expensive side. 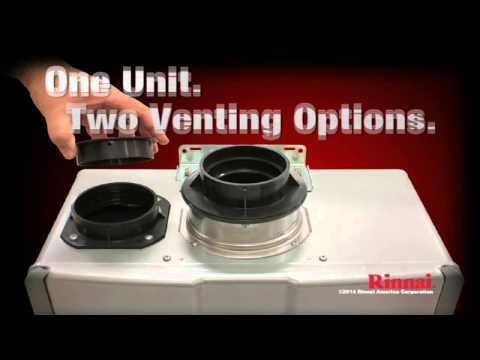 Even though most houses have the standard 0.5-inch connections, the Rinnai RUC98iN requires 0.75-inch MNPT gas and water connections. That means that you might have to make upgrades to your home. In addition, it isn’t easy to install, and professional maintenance is required; you will have to deal with certified Rinnai personnel so that you don’t void the warranty. Since tankless water heaters still aren’t common in most households, people have various questions about them. That isn’t surprising; when you consider making an investment and purchasing an expensive tankless water heater, it is only natural that you wish to know as much as possible. Here is a list of most frequently asked questions that people who read reviews of Rinnai tankless water heater were interested in. Why don’t I have hot water as soon as I turn on the tap? Even though Rinnai tankless water heaters produce endless hot water, they don’t produce it instantaneously. If you aren’t using a recirculation pump, depending on the distance between the faucet you are using and your Rinnai device, it will take a second or two to get hot water. Can I still get hot water if there is no power in my home? If there is a power outage, Rinnai water heaters won’t be able to operate. But, if you purchase a battery backup system, you can still use the heater. What type of regular maintenance do Rinnai Tankless Water Heaters require? Two types of maintenance should be done regularly so that your tankless water heater can remain in good shape. Firstly, your service technician should check the in-line screen filter for debris. Secondly, a professional installer should flush your unit periodically to keep it free from lime and scale. Why is white smoke coming out of the exhaust? In cold weather, the exhaust temperature is significantly hotter than the outside air; that results in water vapor. You shouldn’t worry about that, though. Why does the fan continue to run after I turn off the hot water tap? When the water flow stops, the fan continues to work because that ensures constant water temperatures during rapid stopping and starting. Also, the fan helps exhaust any residual gas flue products from the unit. What is the life expectancy of a Rinnai Tankless Water Heater? You can expect your Rinnai tankless water heater to last up to 20 years. Performance can vary depending on many factors; for example, usage rates, quality of water, regular maintenance, and environmental conditions. Can I install a Rinnai unit on my own? Rinnai strongly recommends that a certified professional handles the installation. The person doing your installation has to be trained to manage the plumbing, electrical and venting aspects of a tankless water heater, as well as gas. If you do it yourself, that can result in performance and operational issues. In the past, there were certain problems regarding tankless water heaters. That has made many potential customers give up the idea of upgrading to this type of water heater. Today, however, most of those problems have been solved; new models of tankless water heaters provide additional benefits. People who have used tankless water heaters for some time noticed significant improvements in newer models. For instance, some consumers used to complain about inconsistent water temperatures. To tackle this problem, Rinnai has introduced a recirculation pump. When added to the unit, this pump ensures that even the first drops of water come out hot and the water stays that way for as long as it’s running. The issue of constant maintenance used to annoy a lot of consumers too. Scale buildup was a major concern in older tankless water heater models. To address this problem, Rinnai has developed isolation valves. The valves make maintenance and descaling the unit much easier. At the very end of our Rinnai tankless water heater reviews, it is time to draw some conclusions. The Rinnai RUC98iN Ultra Series Natural Gas Tankless Water Heater is, without a doubt, a very powerful tankless water heater; actually, it is one of the most powerful ones on the market. Also, it is our favorite one. Besides offering a high level of efficiency, it is compact and sleek; you won’t have any trouble finding the right spot for it. If you want to have unlimited hot water delivered to multiple bathrooms and faucets in your home, and a heater that will last for years (even decades), the Rinnai RUC98iN Ultra Series will be an amazing addition to your home. The initial price and installation may turn out rather expensive; however, remember that this water heater will help you cut down on energy bills in the future. After doing in-depth research and multiple tests, we are happy to say that the Rinnai RUC98iN deserves five stars out of five, in our modest opinion. All things considered, it is really hard to say no to this amazing tankless water heater.